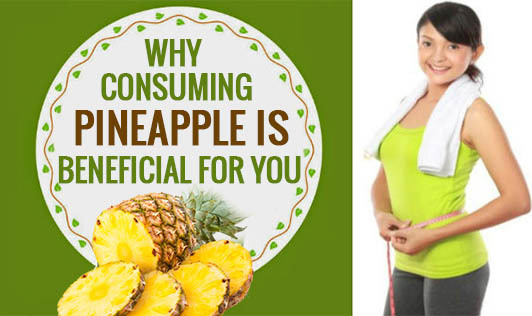 Why Consuming Pineapple is Beneficial for You? 1. Pineapple contains an enzyme Bromelain which helps in breaking down the proteins in our body for better absorption and assimilation. This enables better digestion and improves the health of the digestive tract. 2. Pineapple also has anti-inflammation and anti-clotting properties making it the ideal food for natural detox. 3. Pineapples are acidic in nature and this helps them to keep away any bacterial development in the mouth therefore incapacitating plaque development in the buccal mucosa (the mucous film lining within the mouth). 4. It is an excellent source of Vitamin C. Vitamin C has immunity-boosting properties, useful for collagen synthesis. It helps to maintain the integrity of the blood vessels, skin, organs, and bones. 5. Pineapple also contains high levels of manganese, the essential mineral required for energy production and protection of cells from free radicals. Manganese helps the body use key nutrients such as thiamine and biotin that are essential for bone health and synthesis of fatty foods. 6. The fruit is rich in Vitamin A and Beta-Carotene, both of which boost the immune system and eyesight, and offer protection from free radicals. Vitamins B1 and B6 aid in energy production and the breakdown of sugars and starch in the digestive system. The copper facilitates red blood cell synthesis; and the potassium helps in controlling heart rate and blood pressure. Revel in the benefits of this tasty fruit and grab a bowl of it now!